Bush Africa Safaris - Lephalale (Ellisras) Accommodation. Large knob thorn trees forms a canopy around the luxurious Bush Africa Safari Lodge, which offers a perfect setting for a getaway to the Bushveld, if it is to treat the family or to have a corporate conference. Only 4 hours drive from Johannesburg will bring you to the relaxing atmosphere of everything the Bushveld has to offer. The magnificent lodge consists of a main building and 4 sleeping quarters. The main building consists of a lounge with DStv, fully licenced bar and a dinning area. The self-catering guest will be welcomed in a fully equipped modern kitchen. A boma with an outside fire will provide a place to have a "braaivleis" and a gas grill overlooking the swimming pool is available for those who don't want to stand over the hot coals. For those guests who would prefer to be catered for, will enjoy scrumptious meals either outside by the fire or inside the lodge in the dinning area. 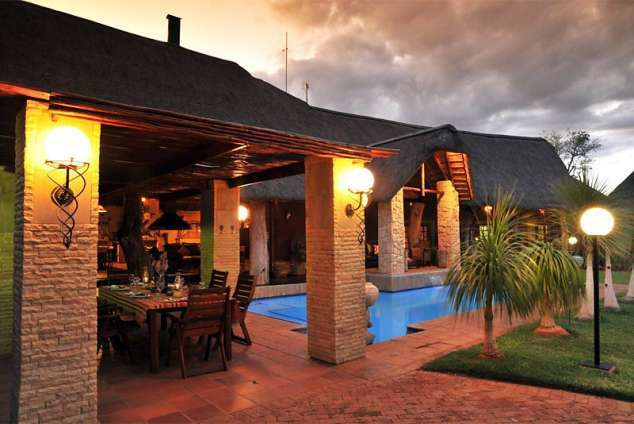 Bush Africa Safari Lodge has 3 luxury en-suite thatched chalets each with a bath and shower. Each chalet can accommodate up to 4 people. Each chalet is equipped with coffee/tea making facilities and a private patio overlooking the garden and pool. Another en-suite room is available adjacent to the main building also overlooking the pool and garden. watching from thatched hides at waterholes are available. A day trip to a white lion-breeding project can be arranged. An archery and shooting range is available and trophy and biltong hunting can be arranged by prior notice. For those who do not wish to drive from Johannesburg, transport can be arranged. The 3000ha game farm is home to several plains game species such as Impala, Blesbuck, Warthog, Blue Wildebees, Gemsbok, Eland, Waterbuck, Zebra, Kudu and several smaller inhabitants. Treat yourself, your family, business associates or a special person to a relaxing getaway from the everyday busy life of the city! Let us make your time away from home as comfortable as possible here in our home. Hope to see you soon! 30270 page views since 06 Jun, 2005.